The adoption and adaptation of open textbooks at the U of S has been an organic process up until this past year, with faculty and departments independently making use of open textbooks and resources to fulfill their own course needs. In 2015 the U of S announced the Open Textbook Creation/Adaptation Fund managed by the GMCTE. At that time the Distance Education Unit’s (DEU) Instructional Design (ID) Team was tapped on the shoulder to officially support these funded activities as well as the growing number of grassroots developments taking place on campus. The DEU’s busy ID team helps design, develop and maintain literally hundreds of online and distance delivered courses for a variety of colleges, departments, units, and centres across campus under the leadership of director Cheri Spooner. And a Learning More section of Supplementary resources. This book is a practical guide to adapting or creating open textbooks using the Pressbooks online publishing platform. It is continually evolving as new information, practices and processes are developed. 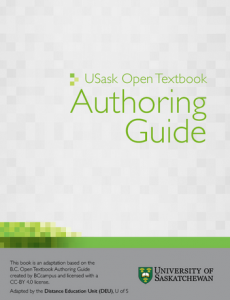 The primary audience for this book is faculty and post-secondary instructors who are developing, adapting or adopting open textbooks at the University of Saskatchewan. However, there may be content within this book that is useful to others working on similar Open Educational Resource initiatives. 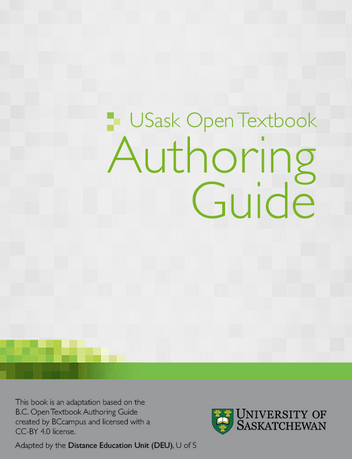 This guide is openly available for download as a PDF and EPUB or is viewable online in its entirety at openpress.usask.ca/authoring. The DEU is looking forward to supporting the upcoming U of S open textbook initiatives as well as continuing to support Online and Distance Education developments across the University of Saskatchewan. This entry was posted in General, Open by Guest Poster. Bookmark the permalink. Good job. Are faculty not associated with the U of S permitted to use this authoring tool? Where is the new material published to? Are organizations (such as Merlot) able to access your database of material? Hi Dave. Currently the authoring tool behind OPENPRESS.USASK.CA is only available to projects directly associated with U of S. However, you can freely install your own instance of pressbooks on your own servers or you can visit pressbooks.com and sign up for your own generic account if you want to play around. Our publications will be available at the same openpress.usask.ca url as this acts as the repository as well. These are all open publications and can be accessed by anyone including organizations. Each publication will display it’s licensing information clearly and can be used in any way the open license allows. Hope this helps.